Summary: The open office layout is one of the most popular office trends that many claim will boost employee productivity. There are some compelling reasons why this might necessarily be the case. If you spend enough time online or talking to coworkers you have probably heard of a number of different office trends. Unconventional office work spaces, breakout rooms for relaxing, working outdoors, having employees choose and rent a workspace for the day, and biophilic design throughout the office are just a few of the many trends that have risen in popularity over the past few years, but how useful or practical are they? Making radical changes to your office layout takes both time and money but the hope is that the investments will ultimately make your office a much more productive environment. The more comfortable your employees feel and the more welcoming your office is, the better and faster your workers should theoretically be. 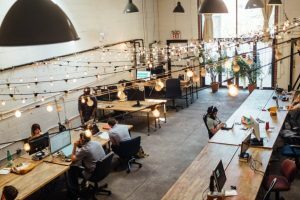 The open office layout is perhaps one of the most popular trends to have emerged during the past decade but there are reasons why this might not be the wisest investment for your organization. When you have several tables and desks around you without any barriers you might start to feel like you have less privacy than you did before. When you have your own cubicle or office you can easily go about your day without worrying about other people. In an open office layout you might stressed about others listening to your conversations. To have a private conversation you might have to step out of the office or wait until after you are done for the day. Another thing some of your employees might worry about is coworkers watching over their shoulders when they walk by. Keeping track of how your employees are doing and how they are spending their time at the office has its benefits but some employees could get stressed about having a place that is out in the open. An additional disadvantage of the popular open office layout is the quantity of distractions it introduces. In a more traditional office setup, barriers, LED video walls in certain cases, and walls separate employees from one another. Your employees will hear each other talking, working, eating, fidgeting, and so forth. There are also a number of visual distractions that could keep your employees from being able to fully focus on their work, such as people walking around or stopping by each other’s desks. There are several distractions that come with a traditional office layout but having the barriers to separate employees as recommended by Constant Technologies, Inc. could help them concentrate more easily.